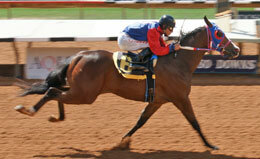 Wagon Cash, under jockey Jesse Levario, debuts with a 1-� length win in the second Ruidoso Futurity trial on Friday. AUROA, CO�MAY 26, 2013�Dream Walkin Farms, Inc.'s Wagon Cash made an impressive debut Friday in the trials for the $780,000 Ruidoso Futurity(G1) at Ruidoso Downs. The daughter of leading sire PYC PAINT YOUR WAGON posted a 1-� length win in the second trial while covering the 350 yards in :17.764 seconds, a 92 speed index into a 10 mph headwind. The Paul Jones trainee held on to the fastest qualifying mark until the 9th race when the wind switched from head to a tail wind. The tail wind increased as much at 15 mph throughout the 25 trails pushing Wagon Cash down to the 12th fastest over all time and putting her in the Ruidoso Juvenile Invitational. Jesse Levario was aboard the homebred out of Cash Finale, by Dash For Cash. Another PYC PAINT YOUR WAGON two-year-old, Wagon Full Of Gold, won the 14th trials by 1 � lengths to post the 13th fastest time of :17.511, qualifying to the Ruidoso Juvenile Invitational. Wesley T. Giles trains the gelding out of Cheyennes Bullion, by Bully Bullion, for the partnership of Ezra Lee, Jill Giles and Melvin Neugebauer.